100 Days Smarter Girl (with swirly girly fonts) applique. Celebrate the 100th day of school in style! Featuring the number 100 in applique (applique steps can be skipped for a quciker stitch out), a colored pencil and swirly girly fonts. 4x4: 3.85 x 3.85 SC: 11,554. 5x7: 5.00 x 5.00 SC: 15,273. 6x10: 6.00 x 6.00. SC: 18,989. 8x8: 7.80 x 7.80. SC: 25,663. 100 Days Smarter Girl (with swirly girly fonts) applique. Celebrate the 100th day of school in style! Featuring the number 100 in applique (applique steps can be skipped for a quciker stitch out), a colored pencil and swirly girly fonts. 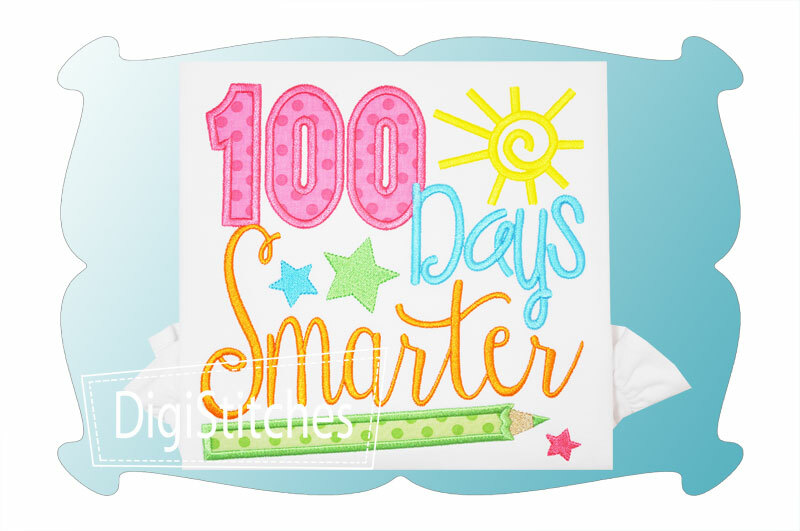 100 Days Smarter Girl applique comes in 4 sizes. All sizes included with your purchase!